Ever since last November when "The Island of Dr. Ned" was given a release date, it seems that Gearbox Software has been committed to providing all the gamers out there with as many opportunities as possible to explore and enjoy the world of Borderlands. This commitment even extends to being mindful of what their community wants to see in their DLC - like an increase in level caps. 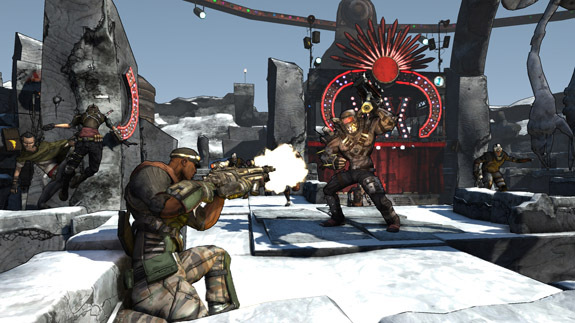 Yesterday, designer Jason "haTts" Reiss announced on the Gearbox forums that the next DLC will increase the level cap and, that like so much of their DLC to date, "it's awesome." Hey guys! Sorry, I haven’t gotten to post on the forums in a while! After finalizing Zombies DLC, the team and I began reading the DLC feedback around the forums on the wants and desires. Guess what, level cap increase anyone? Got it and it's awesome. Hopefully we can get a full announcement out to you guys soon but, man is this the biggest DLC we have made. So don’t worry, we are working really hard right now on both the update (that solves a bunch of issues) and the DLC. More to come guys!! Sounds like the next DLC will really be focused on what the gamers want. We can't help but wonder if it may also include another trip to Old Haven, as Randy Pitchford hinted at so long ago. Regardless of what else the DLC will include or feature, one thing's for certain: Gearbox really is dedicated to ensuring that Borderlands is "a gamer's game." This degree of dedication is more than just a devotion to their IP, but to the fans as well, which is something the rest of the gaming industry should definitely take note of, and something that we hope to see more of in the future.